It has been more than a decade since Peter Jackson unleashed his version of King Kong on moviegoers and while it is not generally considered to be a bad movie, it is a bit slow and definitely had some issues. 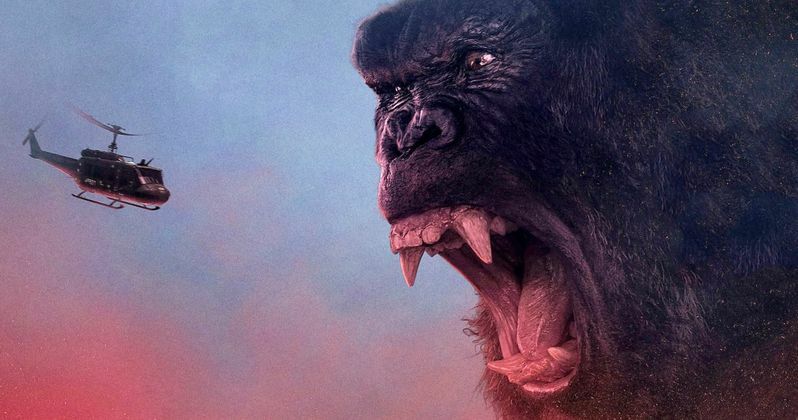 Legendary Pictures is getting ready to reintroduce the legendary ape next month and this time around, it looks to be a pure, action-packed monster adventure. With the release of Kong: Skull Island less than a month away, a new trailer is set to be released tomorrow and we already have a little glimpse at what's to come. The official Twitter account for Kong: Skull Island released a brief but loaded-with-monster-action tease for the upcoming trailer. It was also announced that a brand new and likely final trailer would be arriving online tomorrow. If this brief tease is any indication, we are in for a whole lot of King King duking it out with other beasts. "The story of a King too big to ignore. Tomorrow: Don't miss the new trailer for #kongskullisland. #KongIsKing"
Universal and Legendary Pictures have bigger plans for this new version of King Kong in the future. He is going to be part of their MonsterVerse, which also includes 2014's Godzilla. The two monsters are set to duke it out once again on the big screen in Godzilla Vs. Kong in 2020. While Kong: Skull Island takes place in the 1970s, it has already been revealed that the movie has some connective tissue to Godzilla, with the Monarch Corporation having a presence in both movies. Even though this movie will ultimately connect to a larger universe, it does also seem like it is going to try and stand on its own merits. Kong: Skull Island, stars Tom Hiddleston (The Avengers), Brie Larson (Room), Samuel L. Jackson (Captain America: The Winter Soldier), John Goodman (10 Cloverfield Lane) as well as Straight Outta Compton co-stars Jason Mitchell and Corey Antonio Hawkins. The movie is being Directed by Jordan Vogt-Roberts, who also directed the indie movie The Kings of Summer. It was written by John Gatins (Flight) and Max Borenstein (Godzilla). Be sure to check out the new tease for yourself below and be on the lookout for the full trailer tomorrow. Kong: Skull Island is set for release on March 10, 2017. The story of a King too big to ignore.